Nasty Pig is a brand that keeps on releasing one new collection after the other and we must say, what we have seen so far looks pretty amazing! The experts at Jockstraps.com have just stocked the Initial line and here is what you need to know about it. The Nasty Pig Initial Jockstrap has a nice athletic look featuring a breathable pouch made from a sporty mesh. 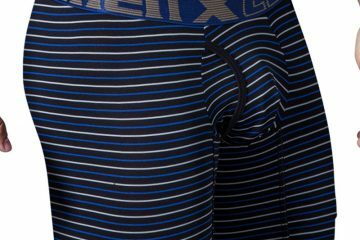 The new waistband is 1.5″ wide and features a modern design with each half in a different colour (blue and off white, or black and grey). The Nasty Pig’s initials appear front and centre of the waistband with a tracer stripe running through. The pouch has complimentary piping around the edges matching the colour of the leg straps. The fabric is a high polyester (90%) blend with 10% spandex. Have a look below at the two colours offered.